As I was tidying up from Christmas, I realized that I never posted the card that our family sent out this year. I love Bordering Blue and Night of Navy (they're among my favorite color combos). This year I included Bravo Burgundy, as well. This was the first year that I utilized my Big Shot in our Christmas card. What a fun way to add some delicious texture (and I could feed multiple layers of Vellum Paper through to make the card-making more efficient). I embossed the Night of Navy piece with the Stampin' Up! Backgrounds I Texturz Plate (small polka dots). 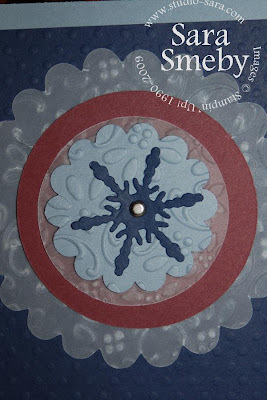 The large Vellum Paper Scalloped Circle (made with the Scallop Circle #2 Bigz Die), Vellum Paper (Modern Label Punch) and Bordering Blue Scalloped Circle (Scallop Circle Punch) were fed through the Big Shot with the Finial Press Textured Impressions Embossing Folder. 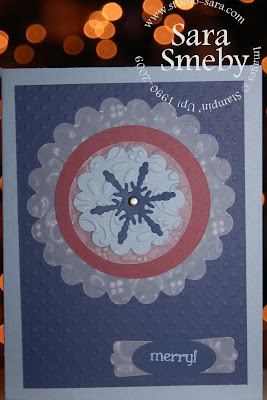 It's hard to see in the photo, but the snowflake is attached to the Bordering Blue Scalloped Circle and Vellum Paper circle with a silver brad and adhered to the Bravo Burgundy piece with a Stampin' Dimensional. Even without a bow or knot, I still take mine to the post office to make sure that they're not too heavy (due to photos) or thick (even this year, I wasn't 100% sure with the brad+Stampin' Dimensional combo). I hope 2010 brings you good health and much joy. Thank you for your visit! Such a pretty Christmas card! Just beautiful. This is so pretty Sara. I just love the vellum layer. Wonderful Christmas card. Very nice card. I need to use my BigShot and embossing things much more often. Lovely! 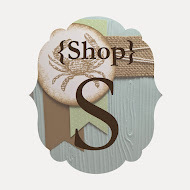 Great card- love your colors and papers! Wonderful card and I bet everybody you sent it to love it also. Love the colors. A Woodsy Happy Birthday to Uncle Coot! I Couldn't Do without You, Birdie! All artwork, photos and text are copyright ©2016 Sara Smeby. I enjoy sharing my artwork and projects for personal use only. Please do not use for publication and/or contests. Thank you.